The Happenstance bar and restaurant has a great choice of world wines, killer cocktails, beers and spirits. There is also a seasonal food menu made using locally sourced produce. 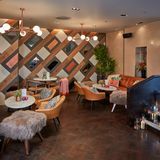 "Perfect for breakfast, lunch, dinner and drinks and the added bonus of a beautiful outdoor terrace with views of St. Pauls Cathedral, The Happenstance is suitable for all occasions. 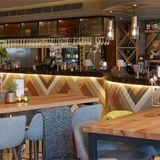 Join us for a bite to eat or a cocktail after work or hire our lounge space and host your own party. We cater for all types of events from corporate dinners to big birthday celebrations and are even licensed to hold wedding ceremonies." By sending this booking your details will only be sent to The Happenstance and will never be shared with other third parties. By clicking this box you agree to the Terms and Conditions set out above. 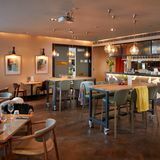 You can book to reserve an area of The Happenstance for you and your friends. Just enter your requirements below to see what they have to offer. 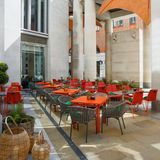 Outdoor terrace with views of St. Pauls Cathedral. What did you think of The Happenstance? I love this venue! Amazing staff, great food and the location is perfect for me - just around the corner from my office. The terrace is one of my favourite places for after work drinks and clients are always impressed when I bring them here. Definitely worth visiting!